Washes away surface impurities and naturally moisturizes to reveal soft skin. This is one of the soaps that I swear by for my body! This soap over time (within the full use of one bar) helped eliminate the appearance of my extremely deep stretch marks from a medical condition. It worked so well my Mother cried when she saw how much better cocoa butter made my skin. Thia stuff also helps to fade the appearance dark marks, discoloration, and scars over time. It smells nice enough, lathers well on the skin and your washing tools. There is a specific one in this line that is called Complexion bar which is green and seems to be made of almost exactly the same ingredients but claims to be more for the face (that is the one I use) the only real difference seems to be the smell (which is like cucumbers with the complexion bar) I find both to work brilliant, I like this brand a lot and have trusted their bar soaps for years now! This cleansing bar smells sooo good. The texture of the soap is nice. I used this as my cleanser because I've heard about the benefits of coco butter. The dark spots on my face had been reducing since I've started using this product. Love love love the AMBI soap line. at first I didn't think it was for me but after trying it I realized that the cleansing Bar with Cocoa butter as well as the complexion bar are great the smell is amazing and makes my skin feel so clean. I love them all. The best part is I paid $1 per bar. I am so happy with my AMBI. I love this soap because I have sensitive skin so I only use dove and this soap. It's really gentle on my skin and it doesn't &nbsp;Irritated it. It smells good and I use it almost everyday when i'm taking a shower. I would really recommend this soap . I love all of ambi's products. I have been using this cleansing bar for a while now. It has lightened all of my dark spots and scars that I had on my face. It makes my skin feel and look very clean. I would definitely buy this again. I made my skin smooth and soft as well. It has a nice scent to it. It is a really good product. I love using this product so much that I would buy it much more. When I get out the shower my skin feel so smooth and it's glowing. The pricing is perfect and it also smells wonderful. You can definitely tell a difference of your skin when you use this product. This soap smells great ! After the first use my skin already had a beautiful glow to it. The cocoa butter helps keep my complexion clear and restores the natural glow. This made my face really dry and it actually made my face breakout even more instead of actually clearing it up. I heard that was pretty common with black soap but after using it so long I just stopped and my face cleared up. I absolutely love this soap, although soap is not supposed to be used in the face. My skin is left feeling so smooth and my tones are evened out just a tad more with every use. I recommend this product for everyone to add to their facial regimen. This soap is amazing!! It helps keep my skin smooth and acne-free. The coca scent is nice too! It was only $1.50. After using it for about a month I noticed a big difference in my skin. It was literally glowing and started to hold in moisture a lot better throughout the day. The only thing I didn't like is that after I would rinse it off my skin felt "rubbery" as if soap was still left on my body. That feeling went away though after actually getting out of the shower and drying off. 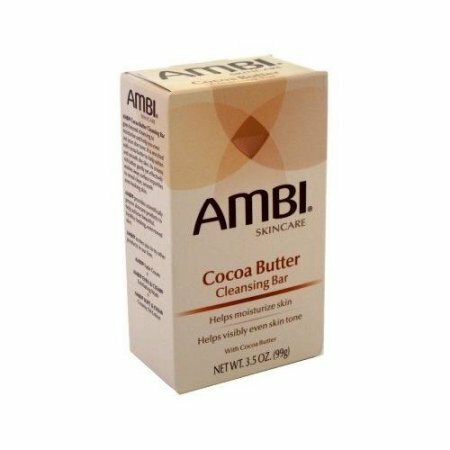 Ambi Cocoa Butter Cleansing Bar goes beyond cleansing to naturally moisturize and help even out skin tone. Its creamy, rich lather gently yet effectively washes away surface impurities to reveal clean, smooth, even-looking skin. Enriched with cocoa butter, dry skin is gently moisturized and softened.